In the winter months, the human body has a tendency to slow down a little, as if you go into hibernation mode. We like to shake things up a little as winters can be long and slowing down too much isn't great for the waste line. In the early days of winter you may find an opportunity to lace up your ice skates and enjoy the natural beauty of Tyaughton Lake at your door step. Cross country skiing also a favorite, and great for that ol' waste line! Ice fishing is a quiet sport that is right there in front of you. Doesn't do a lot for your fitness level, but it does wonders for your state of mind!! So many people are finding the Upper Bridge River Valley to be a gold mine for the avid snowmobiler. We have 3 specific areas that we ride in. 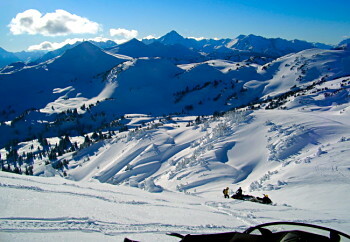 Taylor Basin, is one area you can ride to, most of the season, from the chalets. Lone Goat and Slim Creek are areas you need to truck your sled to a drop off area. All areas will take your breath away and are for the experienced rider. This area is rated as 3rd best in the world for heli-skiing. Yes you can do that too! 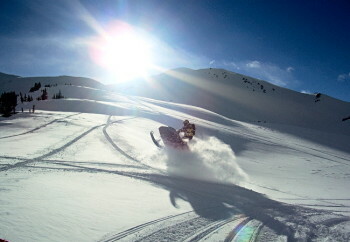 Heli skiing packages are offered ranging from, standby to full week, and multi level packages.